Nourishing nail and cuticle scrub based on precious argan, almond and macadamia oils which, when combined with massage, significantly improve the appearance of the nail plate and nail area. Magnetic grains remove the corneal layer of epidermis and smooth the skin out intensively and the magnet makes this task very easy. The preparation rubs off any soiling and polishes the nail plate, making it look lighter and smoother and it softens and moisturises the cuticle around the nail, which makes it easier to push it back with a stick. Your hands look beautiful and well-groomed right after the first application. How to use: remove the nail polish thoroughly and clean the nails. Dip your hands in warm water and delicately massage the preparation into the nail plate and cuticle around each nail. Massage with circular motions for 5-10 minutes. 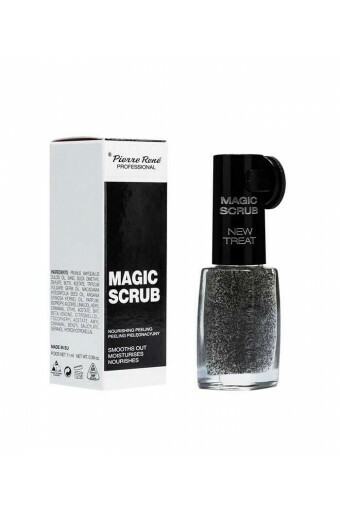 Remove scrub particles using a magnet and massage the remaining oil into the skin and nails until completely absorbed.